We look forward to having you at our Kansas bed and breakfast. Our romantic bed and breakfast spa resort less than an hour from Kansas City, Missouri offers fantastic dining, luxurious rooms, and gracious service. 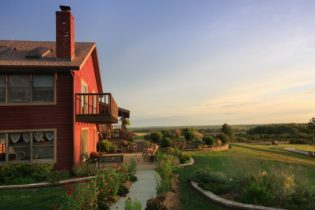 Welcome to Cedar Crest Lodge, a bed and breakfast located in Pleasanton, Kansas. Our wonderful Bed and Breakfast encompasses 113 acres of beautiful rolling hills, trees and ponds. We are a unique rustic retreat offering guests luxury accommodations in the wilderness. At our inn there are numerous trails, a pool, lake for fishing and fire pit for guests to experience all of nature’s wonders. There is also a full-service day spa available for those looking for total relaxation through a variety of spa treatments and massages. Breakfast is a more of a feast at our lodge, where guests are treated to a 2-course event including delicious items including stuffed French toast, pumpkin pancakes and wonderful frittatas. With our 11 bedrooms and various meeting rooms we specialize in hosting such groups as business retreats, church retreats, scrapbooking/quilting groups, family and class reunions and weddings. Your imagination is our limit! We look forward for your visit!